I recently did a quick poll of our SEO clients and found out that 75% of them have been through four or more SEO agencies within two years. 75% of our SEO clients have been through four or more SEO agencies within two years. Most of these clients have been with us for two-plus years, so I’m happy in the knowledge that at least we must getting it right. In listening to their stories of packages, one-size-fits-all proposals, and “SEO article links”, we noticed some common red flags. Some of the problems we heard about were due to the client not taking any time to focus on their marketing and thus only looking at price. Still, I’m the type of person who believes there is very little that is ever the client’s fault. They come to us for help, and it’s our job to educate, deliver results, and keep them from making mistakes. If you’re a small or mid-sized business looking to hire an SEO company, below are some questions to ask, realities to anticipate, and tips for finding a solid SEO provider. This is an absolute must if you are a business owner or in charge of marketing for a website. We have heard of so many issues and bad relationships that could have been avoided with proper note-taking when vetting online marketing agencies. If you have solid notes on what each agency offers, their prices, and their responses to the questions and concerns below, you will be able to make a more informed choice. If you already have a current agency or consultant doing SEO or online marketing for you, ask for a comprehensive breakdown of all work they’ve done. Apart from knowing where your money is going, you can use that info when speaking to a new agency to make sure they don’t charge you for work that has already been done by the previous agency. Does The Agency Start With Price Or With Listening And Asking Questions? Price and cost should not even be brought up by you or an agency until you’ve had at least one in-depth conversation about the goals of a campaign and what is best for the client’s customers. If price is brought up any sooner, run. What you want. Your goals, not the agency’s, are what matters. Your customers/audience. What are your customers’ pain points? What do they need help with? Any good agency should have a set of questions ready to ask about the people that pay you. Your business. What is the story of your company? What message are you trying to put out there? What marketing have you done in the past? What worked, what didn’t, what did you like/not like? What are your expectations? What kind of timeframe do you have in mind? What are you prepared to do to participate in this marketing effort? Contribute content? Social media engagement? PR? What kind of data/reporting do you want and how often? Most good agencies are already going to have processes and answers for most of the above, but you want them to adapt to your needs. If your website audit doesn’t look like this, they didn’t audit your site. Most of our clients share their past audits with us, and they are ridiculously lacking. Usually this is because the agency was offering it at a very low price and they didn’t even think to question it. The problem with only covering these elements is that they are very surface-level and do not uncover other necessary fixes or great opportunities for increasing revenue. Ask the prospective agency about their website audits. Request a sample. If they can’t give you one, ask them to provide a breakdown of what they cover. If it doesn’t go very far beyond the above list, they are not going to audit your site properly. It doesn’t matter if your website is 50 pages or 50,000; a proper website audit is going to need to cover a lot of ground. 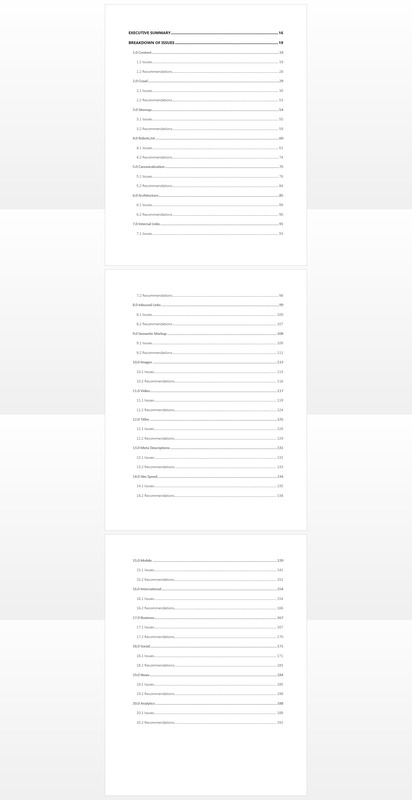 Check out what the table of contents looks like from one of our audits here. Finally, you need to be realistic about cost. When it comes to digital marketing, you should be paying for expertise, not time. That’s why a thorough audit actually worth something is going to cost you. Our audits start at a minimum cost of $3,000, though I’ve seen good audits go as low as $2,000. I would say any less than that and you pay for what you get. Pro Tip: If an agency is offering you a complete audit for less than what we charge, contact us and we’ll show you what is in our audits and how they have driven new traffic and sales to our clients. SEO packages mean packaged work at a low cost. A flexible strategy is out. At best, your business will be treated like every other business in your general vertical. At worst, they will offer you a one-size-fits-all strategy. The point of packages is that they scale. There is no room for unexpected and real issues with your website to be addressed, because those are often “out of scope”. And if there are issues out of scope, expect extra quotes and dollars to be required. Every website is unique with its own set of issues that need to be addressed. There are common SEO and content issues across every website, but they need to be addressed from the standpoint of your business, your funnel, and your customers. Overall, I say leave the packages and level-based pricing to tools and software. If the agency offers a custom option, always go for that. Or run. In a word: More than you were anticipating. Are you starting to see a pattern here when it comes to cost? Look, you’re not bargaining for the best price on jeans here. I tried SEO for six months with three agencies and all I got was this declining traffic chart. In the last section I wrote about avoiding packages because they are built to be inflexible. But this also applies to non-packaged work. In general, proper, professional SEO work is not cheap, nor should it be. A thorough, quality SEO campaign covering all the bases should run you no less than $1,500 per month, no matter your business. Flat out. Who is going to be doing the work and may I speak with them? If the answer is vague, “no”, or that they have a team of people that will work on the account, tell them you want a single point of contact. How can you afford to pay appropriate wages or salary at such a low price point? Some might scoff at this question, but it’s purpose is to find out if the agency is successful thanks to good work or having thousands of client all getting the exact same work regardless of their business vertical and customer type. What will you do to find out about my business and customize the work? Any decent agency is going to have a process in place for gathering data and info about your business and customers, typically in the form of questionnaires, etc. If they don’t have one, you know what to do. *This list was gratefully pulled from Doc Sheldon’s great Search Engine Watch article and the crappy SEO emails I get on a daily basis. My answer again is to ask them how exactly each task they are offering applies to your website and your goals. As I said earlier: A solid, professional SEO company is going to charge you a minimum of $1,500/month depending on your site and the work required. It’s best to just accept that and work it into your budget. Legitimate SEOs are professionals. Their time and expertise are valuable, just like yours. Plus, if done properly, organic traffic can easily yield you a 100% ROI. Better than almost any other marketing channel out there. If you can only afford less than $500/month for SEO, it may be better to handle the basics yourself until you can afford that expertise. Every online marketing effort has to start with some set up work. This goes for social media, PPC, or even blogging. Prep work is required and it often comprises a higher cost during month one compared to the subsequent months in a campaign. The bad agencies know that it’s likely you won’t be getting the work or results promised three or even six months in, so they’re going to try and milk you for as much as possible within that first month or two. You can see that houseofcopy.com is built on WordPress. Know if you already have Google Analytics (or another analytics package) set up. You can use the GAChecker tool. Know if your site is already connected to Google Search Console and whether you have XML Sitemaps submitted, any error pages, etc. Use this guide. Know the previous SEO work you’ve had done and decide if you’re happy with it or not, because they will capitalize on that. Know your metrics: Current traffic, rankings for keywords you feel are good targets, conversion rates, bounce rates, top pages (most of this can be pulled from Google Analytics). Know what links have been built for you or content that has been created for you in the past. Run your website through OpenSiteExplorer.com to get a list of all of your backlinks. Know your website’s platform (WordPress, Drupal, Joomla, Shopify, Magento, custom). Go to BuiltWith.com, enter your domain name, and look at the name of the platform under “Content Management System”. If there isn’t one, it’s likely your site is set up on a custom platform. By having all of this knowledge to hand, you will avoid any trumped up “setup” charges. This is the kind of organic traffic chart they should show you. Pretty self-explanatory, but you’d be amazed how many clients told us they never asked for work samples, case studied, or proof of results. If you check references for people you may pay a salary to, you should do the same for an agency you may potentially be paying. The burden of proof is on the agency if they want your business. Proof of traffic and conversion increases. Ask for analytics charts if they have them available. Not just numbers on a spreadsheet. If they are making a big push for link building or content work, ask them for examples and results of links and that content they’ve created, if they are allowed to provide it. NDAs are the enemy of proper vetting, but they exist for a good reason. Ask to speak with past clients. If they don’t have any samples or references they can share, ask them for one or two specific ideas of what they would do. A lot of bad agencies are very guarded when it comes to sharing even one idea or strategy. A good agency will freely tell you because they are confident that you will not be able to do what they can. Heck, they may have even written a blog post about it. This might be a contentious one. Google’s (and to some extent, Bing’s) algorithms do shape the search results we see in part, but a marketing strategy based on reacting to those algorithm changes is not a marketing strategy at all. Let me be blunt: If you are listening and studying your customers, targeting content to their needs, promoting it, and focusing all of your efforts on pleasing those customers, the algorithms will not impact you at all. Agencies that try to base their strategy off of what the algorithm has done or what they think it might do, are going to fail. Simple as that. If you hadn’t noticed, the whole purpose of this post was to get you to ask some hard-hitting questions to any agency you are thinking of working with for your SEO. There is so much snake oil out there that you could fry a million eggs in it. Protect yourself and make sure you give your business to the good guys. Have questions about how to vet an agency, or thinking about talking to us? Let us know in the comments or ask us a question! We’re happy to answer anything.